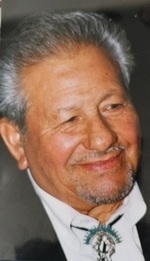 Eleuterio (Rod) Huerta Rodriguez Jr. passed away April 1, 2019, surrounded by his loving family and dear aides. Rod was born in San Benito, Texas and was 94 years old. Rod was a World War II veteran serving in the Navy and Army. While in the military, Rod met his beloved wife, Rosina Sframeli, at a USO dance. They settled in Somerset, NJ where they raised their family and lived for the next 68 years. Rod worked for the US Government at the Raritan Arsenal and GSA Depot. He retired after 35 years and went to work at RWJUH in New Brunswick, in the maintenance department and was a familiar, smiling face to everyone who knew him. He was awarded the RWJUH Medal of Honor in 1990 and celebrated his 2nd retirement from RWJUH 25 years later. He continued to volunteer with the hospital for another 5 years. Rod and Rose were devoted members of St Mary’s Mt Virgin Church in New Brunswick and active members of Somerset and Parkside senior’s clubs. He was predeceased by his dear wife Rosina, 3 brothers, 4 sisters, and his dear son-in-laws Jeffrey Gilman and Douglas Behling. Rod is survived by 4 beloved children and their families; Irene Gilman, Gloria & Alan Rich, Rosemarie & Joseph Rivera, Thomas & Therese Rodriguez and grandchildren Stacey Gilman, Monica & Dan Ginsberg, Jenna Gilman, Laura Rodriguez, Danielle & James Ball, and his 2 great-grandchildren, Mason and Natalie. Rod is also survived by a brother, Pedro. The family wishes sincere thanks to his dedicated aides Debbie, Danae, and Jessica. Visitation is on Thursday, April 4th from 2-4 and 7-9 at the Gleason Funeral Home, 1360 Hamilton St. Somerset. A funeral mass will take place, Friday, April 5th at St. Mary’s Mt. Virgin Church, 190 Sanford St, New Brunswick, followed by burial at St. Peter’s cemetery, New Brunswick. In lieu of flowers, please make donations to St. Jude Children’s Hospital or the Ronald McDonald House. Rod lived by his favorite motto, “One Day At A Time”.